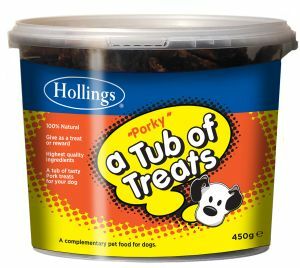 The Hollings Tub of Porky Treats are totally natural, meaty dog treats in a re-sealable tub to keep them fresh and keep the flavour locked in. Below are some recent questions we've received regarding Hollings Tub of Porky Treats for Dogs, including answers from our team. Please can you tell me what the ingredients are in this product? These contain pork sausage, pork strips and pork chips.